Today's look is the second of my OPI Spider-manis! This one features the two brights in the OPI Amazing Spider-man collection, as well as the white that you've seen already in my last Spider-mani. As with the last manicure I did with the OPI Spiderman collection, this is a look that used striping tape. The orange color is OPI Call Me Gwen-ever. It's a lovely bright-yet-dusty orange creme. It has good coverage. You would only need two coats for a regular manicure; for this one I used one thickish coat on top of the white base (OPI My Boyfriend Scales Walls). It's quite an interesting color, though usually I do prefer my cremes a touch brighter. The pink frost is OPI Your Web Or Mine. As you may have read on other nail blogs, this one is a tough color to love. It is a grandmother's pink, and the frosty finish makes it look dated. The color shows brushstrokes very easily, and not even a deft hand can eliminate them completely. Using them in this color blocking mani helped to minimize the unpleasant characteristics. 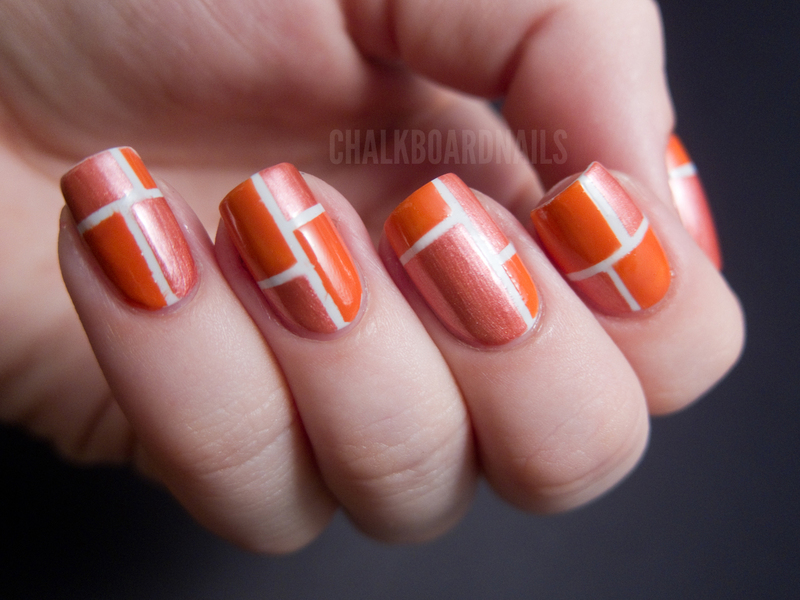 The combination of colors in this manicure as well as the specific blocking makes me think 60's mod. As a refresher, this can be achieved by placing striping tape on a dry, painted nail. In this case my first coat was the white. Then, carefully paint on the sections that the tape has created with your other colors. Clear most of the polish off of the brush when doing this, as big beads can drip down and flood your sections. Carefully peel off the striping tape. Let it dry, and finish with topcoat. The OPI Amazing Spider-man collection will be available in May and will retail for $8.50 per bottle. Product samples provided to me by OPI. I think you did a wonderfu job to display the (hidden) beauty in the universally unloved Your Web Or Mine. I Love the look of this mani, your right about the mod feel to it. Also I think it looks sorta like bricks, in a good way!! It looks cool! I'm not into oranges much but I'd definitely try this in another colour :) Neatly done, as always! This is crazy awesome! I had already decided to buy some striping tape but you just finished convincing me. The frosty pink colour actually goes really well with the orange. Awesome manicure! I have to say that when I got this Spiderman set in the mail I was very underwhelmed. It seemed like the same old stuff. You, with your mad polish skills have made all these colors look good. I still think the pink is going bye bye from my set but I will keep the rest. My favorite is the "white", I think it is grey but OPI is calling it white. I can see me using the white one a lot. Thanks for sharing your great manicures. I strive to be as cool as you someday, or at least have my polish look as clean and neat! 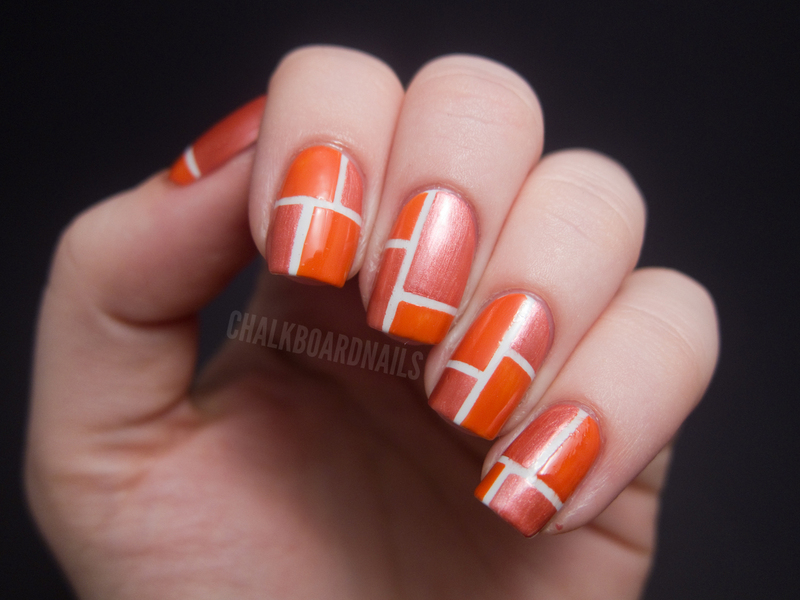 I love the pattern you created, I love the color combo, I love everything about this mani! This pattern is AHmazing! The colors look great together--another fantastic mani with the Spiderman collectio! Your Web or Mine really is a tough color to love, but you made it look great with this combo. I wish there was at true red in this collection to match Spiderman's suit.. Very Original and PERFECT! I love it! Wow, you managed to make two colors that I wasn't interested in buying look really awesome! Love the mod orange/pink combo...and now I might need to get these too! I love this bright mani! 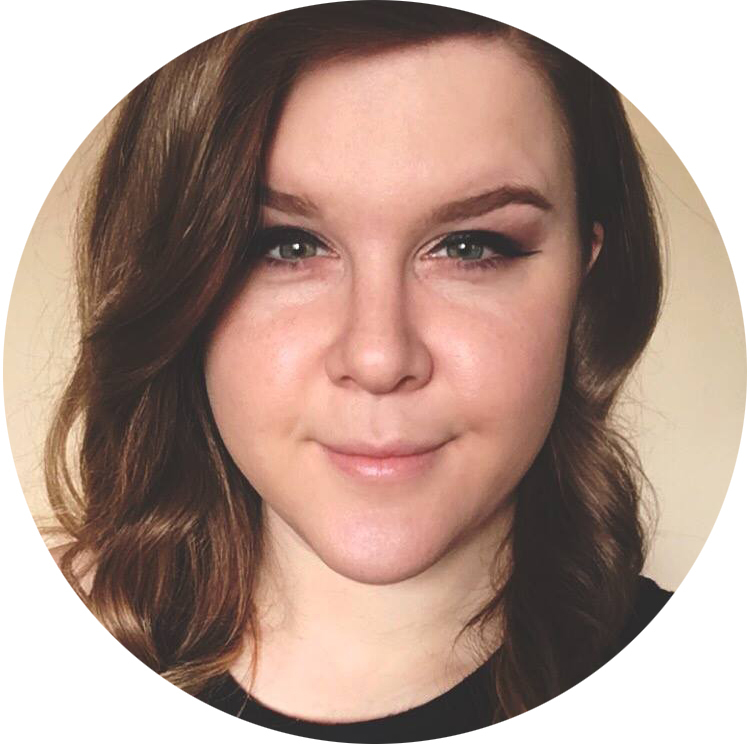 this is so pretty, youre so creative! I love it! So where do you get your striping tape? I'm not keen on this OPI collection but this mani looks amazing! I love this design! 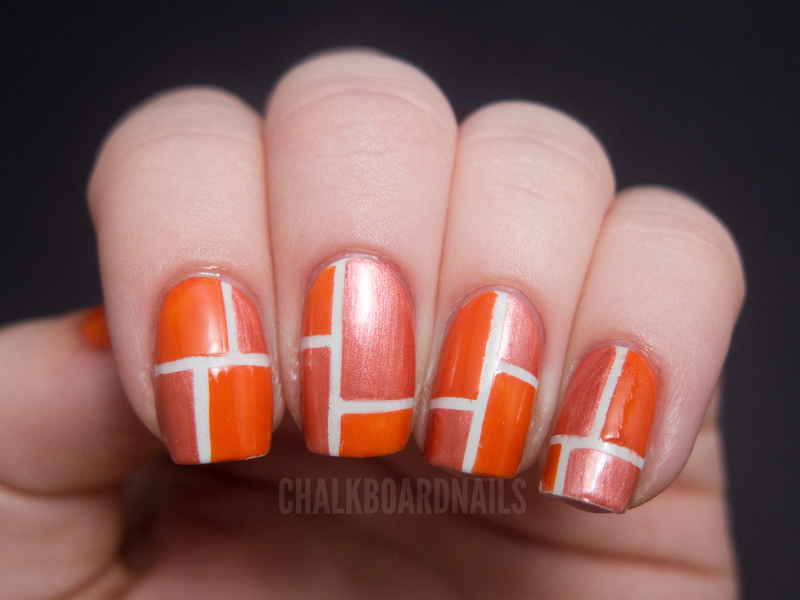 I can't wait to recreate it when I finally get some striping tape.